Supreme Court justices are exempt from oversight under the federal judicial code of conduct, and it is left up to them in order to self-regulate their recusal from cases. Ideally, justices identify any conflict of interest which may cause them to be biased while deciding a case (ex. financial conflicts of interest) and they voluntary recuse themselves from the case in order to prevent a biased ruling from being handed down. Unfortunately, Justice Clarence Thomas has failed to conform to this code of conduct, particularly in regard to cases involving Monsanto Co. 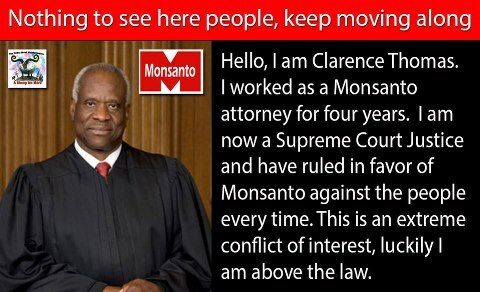 In the 1970s—from 1976 to 1979—Clarence Thomas worked as a corporate lawyer for the Monsanto Corporation, thus creating a serious conflict of interest for him when deciding any case involving Monsanto. While some on the right (including Monsanto) have argued that Monsanto was a chemical company without involvement in GMOs when Thomas worked there, thus there isn’t a conflict of interest, this simply is not the case; in any situation where a judge worked with, for, or against a plaintiff, there is a real conflict of interest. Monsanto Co. v. Geertson Seed Farms: In 2010, the Supreme Court decided a case that affected regulations on GMO “RoundUp Ready” alfalfa. The decision of this case was a 7-1 vote, in favor of Monsanto. Despite his obvious conflict of interest, Thomas did not recuse himself from this case. In contrast to Thomas, Justice Breyer recused himself from the Monsanto v. Geertson Seed Farms case because his brother, Charles Breyer, was the Federal judge whose decision was being appealed. Bowman v. Monsanto Co.: In 2013, the Supreme Court decided a case which expanded the patent rights of GMO manufacturers to include naturally reproduced seed stock—this would prevent farmers from saving and naturally replicating Monsanto seeds as they would do with spare non-GMO seeds. While this decision was unanimous and Thomas’s vote was ultimately irrelevant, the fact that he refused to recuse himself in a case of such import involving his former employer is indicative of his pattern of disregarding conflicts of interest. While there is no direct evidence supporting any continuing financial entanglements between Justice Thomas and Monsanto, there are several indirect connections which further increase the conflict when Thomas decides a case involving Monsanto (these connections are interesting but unnecessary, as the simple fact that he worked there is enough of a conflict to necessitate recusal). Over the past few years, Justice Thomas has taken numerous expensive gifts and social engagements from groups which are extremely pro-agribusiness. In particular, Thomas’s acceptance of a $15,000 “gift” from the American Enterprise Institute and his speaking engagements in front of the Federalist Society present a conflict in regard to his deciding GMO cases. Both AEI and the Federalist Society consider themselves conservative “free-market” think-tanks, and have been virulently against increased regulations on GMO producers. As such, Thomas’s involvement with these groups creates a pressure for him to rule in favor of corporate interests—after all, if he were to vote against GMO producers, it is likely that he would no longer receive the money of AEI or the prestige of speaking in front of the Federalist Society. Long story short, Supreme Court Justice Clarence Thomas is irreparably entangled with Monsanto—both in his past employment and his current affiliations—and he should automatically recuse himself if Monsanto has any involvement in a case. Unfortunately, Thomas has demonstrated a shocking lack of judicial ethics—he has taken numerous “gifts” from people with interests in his court, “forgot” to report his wife’s lobbying income for years, and has refused to recuse himself from cases, even when there were glaring conflicts of interest—and it doesn’t appear as though this will change any time soon. If he were on any other court in the land, Thomas’s ethical violations would have resulted in his removal from the bench, but the fact that he is a Supreme Court justice virtually immunizes him from oversight. For the immediate future, it appears that Monsanto has at least one friend on the Supreme Court who will put aside judicial ethics in order rule in its favor. Short and sweet, clear and to the point. He is, indeed, a piece of garbage. Justice Thomas hasn’t said much in his tenure. Most of what he appears to do is dutifully vote as either Justices Roberts, Scalia, and/or Alito vote, without much fanfare. I suppose there’s no prayer of combating such a strongly politically divided Court, with the only recourses of : “packing the court” or the impeachment and removal of Justice Thomas; since either possibility would require the present US House to decree it. And, of course, if one of the presently sitting Justices should retire, what an strident fight would ensue over who would replace them! RECUSE IS THE WORD HE SHOULD HAVE RECUSED HIMSELF AND STEPPED ASIDE. IT IS TERRIBLE HE IS A SUPREME COURT JUDGE. HE SHOULD STEP DOWN! HE DOES NOT DESERVE TO BE IN OFFICE. Why is it that the system is so broken? He is a Supreme Court judge. Why is there a code of ethics for other judges and they cannot even receive a pen, when judges in our highest court can be given gifts and favors with no consequences. This saddens and disgusts me knowing that he puts himself in a questionable, if not unethical, deplorable position. The next thing I question is if he acts like this with Monsanto, what else has he compromised himself for? In theory, the Supreme Court is insulated so that they can make the hard, right choices without fear (desegregation); unfortunately, the right wing has made a concerted effort to corrupt the court with corporatists and has been extremely successful. Hey Josh. Great stuff. The above Monsanto/Thomas graphic & funny line: I’d like to use it on my website due out soon. Can’t pay as we’re broke most of the time (what else is new? ), but I can give you the credit line: Josh Sager’s The Progressive Cynic . So can we have permission to use? Thanks a ton. Please, feel free to repost any of my articles, with attribution and a link back to my site. I write as a form of activism and, most of the time, don’t really expect to make money from it, so I am just glad to get the extra readership. Recusal is an issue that judges apply with discretion, I’m not a judge and don’t play one on TV, but this article leaves some doubt as to the appropriateness of whether recusal was appropriate in these cases.